It was September 2012, and the Energy for Development (E4D) team was returning from their first visit to Kitonyoni, an off-grid, rural market district in Makueni County, Kenya. An hour into the flight, they were discussing why so many rural electrification projects in developing countries tend to fail and fall into disrepair. Determined not to let this happen in Kitonyoni, they recognised their main challenge was to build a socially and economically sustainable model for rural electrification. This raised many questions, such as: How could they devise a service model which would generate sufficient revenues to sustain the system but remain affordable despite low and seasonal incomes? Which ownership or governance mode would ensure community engagement; whilst at the same time recover the capital cost of installing a photovoltaic (PV) micro-grid? Finally, how could they reduce their capital costs by optimising the system design to meet local energy demands? The case was written for the purpose of challenging business management and development economics students across undergraduate, masters and MBA programmes. As part of their Innovation Challenge at Imperial, MBA students were required to present their solutions and a completed spreadsheet showing the transactive structure of a rural electrification (RE) business model for Kitonyoni to their peers and a panel of judges, including the former Head of BP Alternative Energy and members of the E4D team. The full case study can be found on the Case Centre website here. Please get in touch with Imperial College London or the Energy for Development team if you are interested in using the case study as part of your own teaching. On 26th February 2014, the Energy for Development (E4D) team met at the Dana Centre in London to deliver an MBA workshop on RE business models. As part of the MBA Innovation Challenge, students were set the task of delivering an affordable energy solution to the village of Kitonyoni, Kenya. The case study was based on ongoing fieldwork funded by the EPSRC and carried out by Southampton University’s Sustainable Energy Research Group (SERG) and Imperial College Business School. The task required students to take both a qualitative and quantitative approach towards assessing the energy needs of the local population, their willingness to pay and matching these requirements with the photovoltaic (PV) system design. Students were also asked to propose an appropriate financing model for similar roll-outs in rural East Africa and present their solutions to the class. The case study itself is one of the first of its kind to appear on the Case Centre (the European Case Clearing House used by business schools and universities worldwide), which encourages students to investigate both socially and economically sustainable business models at the base of the pyramid. It is a snapshot of the decisions facing the Energy for Development (E4D) team in September 2012 after returning from their first visit to Kitonyoni, an off-grid, rural market district in Makueni County, Kenya. This particular RE project represents a departure from previous approaches to rural electrification in developing countries, which have tended to fail and fall into disrepair due to inappropriate an unsustainable revenue/financing models. Determined not to let this happen in Kitonyoni, the main challenge facing the E4D team (and the MBA students as part of the challenge) is how to build a socially and economically sustainable business model for the village. Over the course of the week, guest lectures and workshop sessions helped to raise a number of questions related to business model design in so-called Base of the Pyramid (BOP) markets, such as: How to devise a service model which generates sufficient revenues to sustain the system but remains affordable despite low and seasonal incomes? Which ownership or governance models ensure community engagement; whilst at the same time recover the capital cost of installing a photovoltaic (PV) system? And finally, how to reduce capital costs by optimising system design to match local energy demand? At the beginning of the week, the E4D team set the challenge, whilst a supplementary Part B was provided at the end of the challenge to describe exactly how the business model was executed in practice. Encourage students to consider a range of socioeconomic and institutional factors affecting the adoption of products and/or services in low-income and geographically distributed markets, as well as governance and financing decisions involved in business model design at the Bottom of the Pyramid. Enhance team-based decision-making amongst students and the use of both qualitative and quantitative analysis skills. Ensure that by the end of the exercise, students are capable of devising a suitable business model for rural electrification, which is socially and economically sustainable, as well as replicable in other less developed countries (LDCs). Help students to use the excel sheet and the information provided in the case in order to come up with an optimal system design which meets the needs of local businesses and households in Kitonyoni. 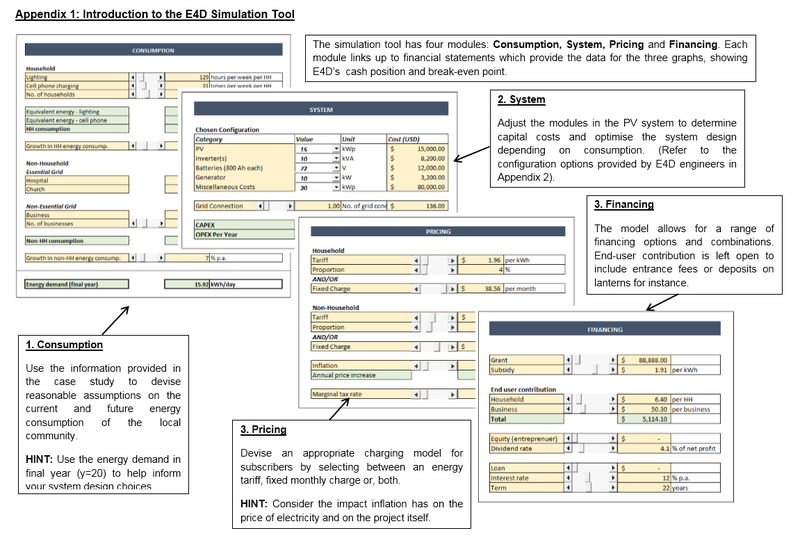 Students should be taught the importance of consistency in system design with current and future energy demands of the local community and the modularity of the PV system and the system costs associated with different design options. Suggest a range of pricing models and benchmarking approaches used in rural electrification projects for students to propose a revenue model which is sustainable and affordable. Encourage students to experiment with different tariff or charging structures for households and businesses based on local economic circumstances, such as low and variable household incomes (cash vs. credit models) and the price of existing energy sources (benchmarking). Lead students to devise an appropriate financing model capable of sustaining operations and management costs and paying back capital costs – one which is linked to an assessment of the pros and cons of different governance arrangements. Help students to understand a range of societal and institutional factors involved in infrastructure projects at the Bottom of the Pyramid such as political/country risk, effects of inflation on project costs and service affordability, governance arrangements and community aspects relating to sustainability of the business enterprise. Teach students the importance of local capability development and training, community ‘buy-in’ and education around non-renewables and alternative energy sources open to the community, and the social and economic benefits of switching to a sustainable electricity system. The case would work best as part of a team-based exercise (4-5 people per group), where the task set to students involves reading the case material, carrying out analysis and presenting a 5-10 slide presentation on their proposed business model for Kitonyoni. This should include a qualitative assessment of social, economic and institutional issues involved and how to overcome them in order that their business model is socially sustainable. This presentation should be accompanied by a completed version of the spreadsheet tool which demonstrates their solution is also economically sustainable. Posted in Inclusive Growth. Tagged Africa, business models, MBA, Renewable Energy, rural electrification, social enterprise.